Do you have aesthetic and functional issues with your yard? Retaining walls serve a multi-purpose and oftentimes exceed their expectations. When built to their full potential, a retaining wall can be the most significant piece of your landscape. It’s true that some people take on this type of project themselves, and you can easily find step by step instructions on how to build a retaining wall online or in a book. The fact that you found this page on our site though may mean you’re having doubts, in which case, we highly recommend letting an expert with a high success rate take on this job. We have no problem admitting that there are some projects where a competent homeowner can tackle him/herself, but this honestly is one that’s better left to the hands of a specialized contractor. The construction of a retaining wall involves much more than simply putting the “building blocks” in place. The builder must understand the purpose of the wall, foresee how it could fail, and then create a structure that meets its demands. One must be familiar with the concept of ‘lateral earth pressure,’ know how to calculate the stability of the wall, and also construct something that’s more than effective, but that is attractive, as well. You have to take into account drainage, terrain, placement, and more. While these are all elements your contractor will need to address, there are a few you’ll want to consider alongside him/her. What’s the budget for this project? What’s the requested design (type of materials, spot, height, etc.)? Is there a preferred timeline? Last but not least, we’ll need to analyze site accessibility, material availability, and possible building codes. 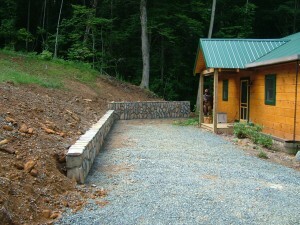 If this is information overload, rest assured that Carolina Dreambuild, Inc. is knowledgeable and experienced in retaining wall implementation, and will gladly handle your project in an efficient and effectual manner.